There are essentially two types of goals that a libertarian can work toward. There are the goals of advancing specific libertarian causes that will have an immediate impact in the world and there is the grander goal of moving toward a complete libertarian society. The great libertarian theoretician and strategist Murray Rothbard recognized that because, in the here and now, the libertarian movement is very small, it does make sense to form alliances with other groups when seeking to advance libertarian goals. It does not mean support for all positions of other groups that libertarians align with but merely working in conjunction with common goals of both groups. In such a way, the reach of the libertarian megaphone is expanded. This brings me to the post, US Conference of Catholic Bishops Condemns Trump Administration Policy of Separating Parents From Their Children at Border. Let us set aside for the present the absurd view that hard working people are somehow savages who are attempting to come to America to work for people who want to hire them, and just consider the nature of strategic alliances. From a strategic alliance theory libertarian perspective, it doesn't matter what the driving force is behind the alliance partner's desire for a libertarian goal. If the alliance can expand the reach of the megaphone of libertarian principle, it can be a sound alliance, provided that the alliance is limited to what is in common to both from a libertarian perspective and that the prospective alliance partner does not do harm to the advance of the greater libertarian movement by being a prospective partner that most of society looks down on, and with good reason, say an alliance in modern-day America with Nazis. I join Bishop Joe Vásquez, Chairman of USCCB's Committee on Migration, in condemning the continued use of family separation at the U.S./Mexico border as an implementation of the Administration's zero tolerance policy. Our government has the discretion in our laws to ensure that young children are not separated from their parents and exposed to irreparable harm and trauma. Families are the foundational element of our society and they must be able to stay together. There is nothing here that a libertarian can object to, that is, proclaiming outrage at the horrific separation of parents from children as a border crossing deterrent policy. The Trump administration is just evil here. Federal public defenders say that immigration enforcement officials in the United States have repeatedly deceived immigrant parents arriving in the US seeking shelter from violent conditions in their home country, telling those individuals that they are taking their children away for baths or other benign reasons only to never return with them. Miguel Nogueres, a federal public defender in McAllen, Texas said that he’s seen a dramatic increase in the number of cases his office sees on any given day during the presidency of Donald Trump, and that he has been hearing from clients that they were lied to by Border Patrol agents when their children were taken away, and not being given further information about the whereabouts of their kids. This is positively sick and there is no reason that a libertarian can't point out, on this limited issue, that the US Conference of Catholic Bishops recognizes that it is evil. 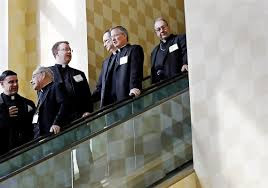 This has nothing to do with endorsing the greater views and actions of the bishops, it is attempting to simply join battle with the bishops in attempting to halt one of the most vicious practices of the Trump Administration. This is the nature of libertarian alliances. Robert Wenzel is Editor & Publisher of EconomicPolicyJournal.com and Target Liberty. He also writes EPJ Daily Alert and is author of The Fed Flunks: My Speech at the New York Federal Reserve Bank . and most recently Foundations of Private Property Society Theory: Anarchism for the Civilized Person Follow him on twitter:@wenzeleconomics and on LinkedIn. His youtube series is here: Robert Wenzel Talks Economics. The Robert Wenzel podcast is on iphone and stitcher. So libertarians should be against state agents kidnapping the children of those who disobey the state? I agree, but it’s insane that this even needs to be pointed out. Wenzel is auditioning for a CATO job these days it seems. Oh how the mighty have fallen. Oh yeah,they are pushing "Foundations of Private Property Society Theory: Anarchism for the Civilized Person" real hard at Cato.